This edition’s selections are all impressive, but we start with SUNY Maritime College’s Dominique Rigby, who hails from the Bahamas. Three more pro? les round out this solid quartet, taken from four different maritime campuses around the country. Dominique Rigby, you don’t have the wife, the kids, and the mortgage. I’m lean- of the Bahamas ing that way so far but if that doesn’t work, the back-up plan is managing a resort or a plant. I’m more of a practical, hands-on person than someone who wants to be locked up in an of? ce. 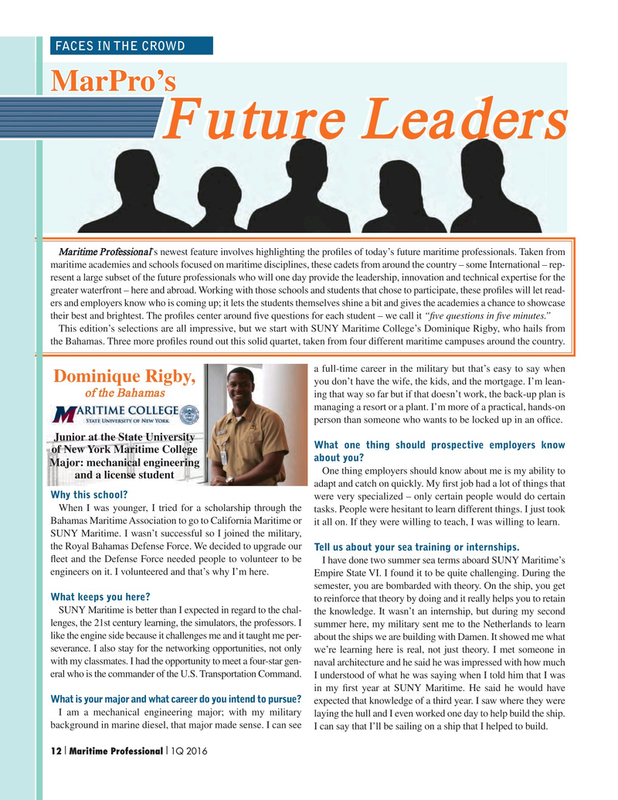 What one thing should prospective employers know of New York Maritime College about you? Bahamas Maritime Association to go to California Maritime or it all on. If they were willing to teach, I was willing to learn. SUNY Maritime. I wasn’t successful so I joined the military, the Royal Bahamas Defense Force. We decided to upgrade our Tell us about your sea training or internships. I have done two summer sea terms aboard SUNY Maritime’s engineers on it. I volunteered and that’s why I’m here. SUNY Maritime is better than I expected in regard to the chal- the knowledge. It wasn’t an internship, but during my second lenges, the 21st century learning, the simulators, the professors. I summer here, my military sent me to the Netherlands to learn like the engine side because it challenges me and it taught me per- about the ships we are building with Damen. It showed me what severance. I also stay for the networking opportunities, not only we’re learning here is real, not just theory. I met someone in with my classmates. I had the opportunity to meet a four-star gen- naval architecture and he said he was impressed with how much eral who is the commander of the U.S. Transportation Command. I am a mechanical engineering major; with my military laying the hull and I even worked one day to help build the ship. background in marine diesel, that major made sense. I can see I can say that I’ll be sailing on a ship that I helped to build.